A UK composites organization plans to host an event to bring together industry representatives and the further educational market. 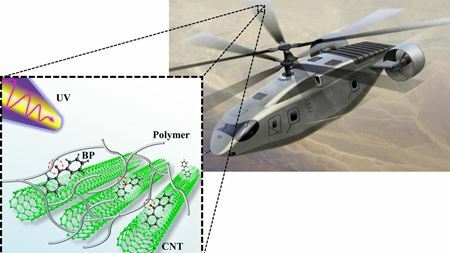 A novel technique for inducing a composite material to become stiffer and stronger when exposed to UV light could find use in future military rotorcraft. Kaman Composites, has reportedly expanded its manufacturing capacity by investing almost US$2 million. Gurit has reported an increase in net sales for the first three months of the year of 5.4% compared to the same period of 2017. Coating specialist Covestro LLC has developed a new processing technique called direct coating to make high-gloss piano black. Composites UK, the trade association for the UK composites supply chain, has released info about its upcoming events in April. Metyx Group has acquired a manufacturing facility in North Carolina, USA, to house its new US$3.5 million technical textiles division. Carbodeon and Dutch 3D printing specialist Tiamet 3D have announced the first nanodiamond-enhanced filaments for 3D printing.